Belgrade Apartments and International Companies. Genex is one of the pioneers in introduction of business and financial information systems, and was the first to introduce Mc’Donalds in Yugoslavia and Russia, bring back Mazda on domestic market and initiate numerous business projects in various spheres and activities. 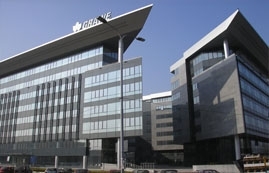 Genex had grown into an economic giant which accounted for over 10% of the Yugoslav foreign trade, had more than 60 foreign branches in the world, over 900 big business partners in the country and 1.500 throughout the world, more than10.000 agents in tour-operating activities, it used to bring some 900.000 tourists to Yugoslavia yearly, it had hotels in Belgrade, on the Adriatic coast and on Mt. Kopaonik, it had a modern fleet of 9 Boeing jet planes and more than 5.000 employees. Nevertheless, in spite of all temptations, hardships and pressures, Genex managed to preserve its property, business reputation and certain number of its employees as a precondition for its further successful operation and a forthcoming process of privatization. The Company International CG d.p. Beograd was founded at the end of the year 1999 with specialized units for the most of Genex business activities done for many years. Offering traditional and contemporary elegance apartment is a fantastic choice when visiting Belgrade. The area gives you a lot of opportunities to walk to all the attractions in the city.